Inflammatory cues trigger microglial cells to release the protein ASC. 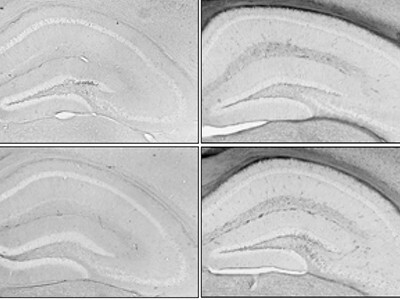 It emerges that specks of ASC promote a hallmark of Alzheimer’s disease in the brains of mice — aggregation and deposition of amyloid-β protein. Richard M. Ransohoff is in the Department of Cell Biology, Harvard Medical School, Boston, Massachusetts 02115, USA. From one perspective, Alzheimer’s disease can be considered to be relatively simple: it requires the formation of aggregated clumps of the protein amyloid-β in the brain, which promote a string of downstream consequences that lead to dementia. But when all contributing factors are taken into account, it is fearsomely complex. For instance, consider the potential role of inflammatory processes. There are many indicators of inflammation in Alzheimer’s disease1: levels of immune molecules are elevated; neuron-supporting cells called glia react strongly to the abnormal tissue environment; and changes arise in the specialized vasculature of the blood–brain barrier. Furthermore, subtle genetic alterations in glia can augment the risk of developing Alzheimer’s disease2. But despite this evidence, details of how inflammation might promote the disease have been evasive1. On page 355, Venegas et al.3 provide evidence that, in mice, an extracellular form of an immune-activation protein promotes amyloid-β aggregation. Amyloid-β is derived from a larger protein, amyloid precursor protein (APP), which is cleaved to produce a family of shorter peptides. Alzheimer’s disease can be caused directly by mutations in either APP or the enzymes that process it, if they lead to the production of versions of amyloid-β that are prone to aggregating into soluble, cell-damaging clusters. These soluble amyloid-β aggregates subsequently undergo further aggregation and are deposited in brain tissue in clumps called amyloid plaques4. These groundbreaking findings undergird all research into the disease. But the specific mechanisms by which plaques form have been elusive. And given that, so far, all phase III clinical trials of prospective disease-modifying therapies have failed5,6, the identification of specific molecular players in plaque formation would be extremely welcome, because it could accelerate the development of better therapies. Venegas et al. began from their group’s previous observation7 that mice lacking the protein NLRP3 have some protection against amyloid-β deposition. This finding was obtained by deleting the Nlrp3 gene in a mouse strain dubbed APP/PS1, which has been genetically engineered to express human genes that contain mutations associated with Alzheimer’s disease; animals therefore show abundant deposition of aggregated amyloid-β and cognitive impairment. NLRP3 is an immune sensor that, in the brain, is found in immune-related cells of the central nervous system called microglia. It detects abnormal biochemical substances, including the products of damaged cells, and initiates the formation of a large intracellular protein complex called the inflammasome. This contains NLRP3 itself, long fibrils of the protein ASC and an enzyme called caspase-18. The inflammasome’s best-characterized function is to enable cells to release the pre-formed pro-inflammatory proteins interleukin-1β (IL-1β) and IL-18, which are produced in response to earlier inflammatory signals — in the case of Alzheimer’s disease, soluble forms of amyloid-β9. IL-1β and IL-18 are potent immune mediators that have crucial roles in host defence and in inflammatory responses. Presumably because of their potent effects, these interleukins are held within cells until inflammasome formation, ensuring that they are released only when needed. Intracellular inflammasome formation is followed by the release from cells of complexes of ASC called ASC specks (Fig. 1). In many non-immune cells, ASC-speck release is accompanied by cell death10, but in immune cells, including microglia, ASC-speck release is often better tolerated and can propagate inflammation — perhaps because ASC specks are taken up by neighbouring microglia to mediate further interleukin release. Figure 1 | Amyloid-β protein and inflammation. The aggregation of soluble amyloid-β peptides and their subsequent deposition in clumps called plaques in the brain is a key component of Alzheimer’s disease. 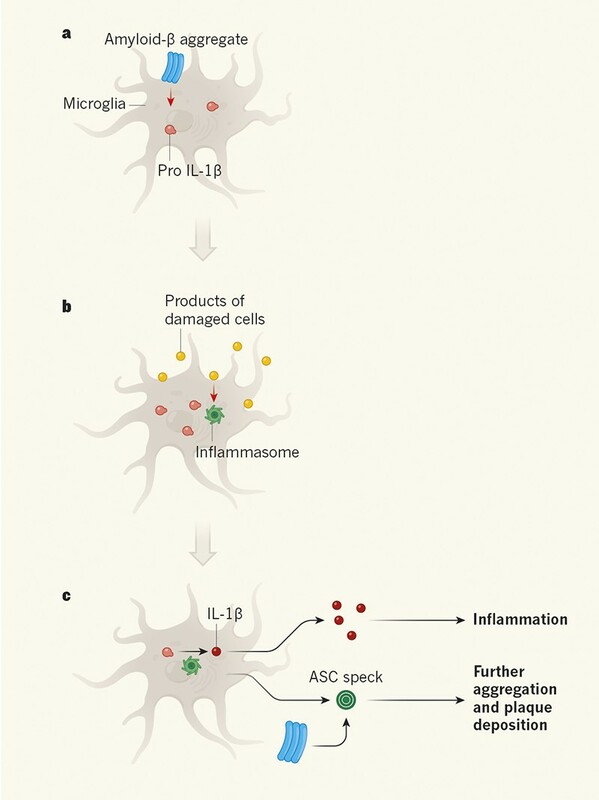 a, Soluble amyloid-β aggregates can trigger the formation of precursors to inflammatory proteins, such as pro-IL-1β, in immune-related cells of the brain called microglia. b, As the disease progresses, cells are damaged and release products that can trigger formation in microglia of a pro-inflammatory protein complex called the inflammasome. c, The inflammasome cleaves pro-IL-1β to produce the protein IL-1β, which is released and induces inflammation in the brain. Microglia also release complexes of the protein ASC (a constituent of the inflammasome) called ASC specks. Venegas et al.3 have provided evidence in mice that ASC specks interact with amyloid-β aggregates to promote their deposition as plaques. Venegas et al. investigated whether the protection against amyloid-β deposition seen in mice lacking NLRP3 might be related to ASC specks. First, the authors mixed ASC specks with amyloid-β in vitro. They found that amyloid-like aggregates formed rapidly in the presence of ASC specks, with higher speck concentrations yielding more aggregates. The researchers also demonstrated that ASC was incorporated into amyloid-β aggregates in test tubes. Moving on to work in vivo, Venegas and co-workers showed that APP/PS1 mice genetically engineered to lack ASC showed much less deposition of amyloid-β aggregates in the brain, and performed better on spatial-memory tasks, than did APP/PS1 mice in which ASC was present. Next, the authors injected brain extracts from aged APP/PS1 mice into the brains of young animals of the same strain that hadn’t yet developed plaques. The brain extracts could trigger the formation of amyloid-β deposits in the brains of young APP/PS1 mice, but not if the young animals lacked ASC. Equally, extracts from aged APP/PS1 mice lacking ASC were less able to promote plaque formation in young APP/PS1 recipients. Finally, the group found that antibodies to ASC, which prevent the specks from binding to other proteins, suppressed the formation of amyloid-like aggregates when combined with ASC specks and amyloid-β in vitro. Furthermore, when brain extracts from APP/PS1 mice were injected into recipient animals along with ASC antibodies, amyloid-β deposition was reduced, compared with transfer without the antibodies. Together, Venegas and colleagues’ data make a strong case that ASC specks help to promote amyloid-β deposition in APP/PS1 mice. The experiments the group performed were challenging, because both ASC protein and amyloid-β peptides are prone to aggregating not only with themselves, but also with other proteins11. However, the authors’ careful use of controls enabled them to demonstrate that the phenomena they report reflect biologically meaningful interactions, rather than nonspecific aggregation. Does this paper point to future treatment strategies? At present, there are no firm associations between genetic traits affecting susceptibility to Alzheimer’s disease and the NLRP3–inflammasome–ASC-speck pathway. If found, these could help to guide future work. Nonetheless, in mice, inflammasome activity seems to promote brain ageing on multiple levels12, by causing a low-grade inflammation (both systemic and in the central nervous system) that is associated with age and midlife obesity — both of which are risk factors for Alzheimer’s disease. If putative therapies are to be effective, it will be important to ascertain which part of the pathway to target. Inhibiting an upstream part of the process, such as NLRP3-mediated inflammasome formation, would have more wide-ranging effects, but also carries the potential risk of compromising host defences13. By contrast, targeting a downstream aspect of the pathway — suppressing formation of ASC specks selectively in the brain, for example — would be more specific, but might not sufficiently inhibit the manifold pathogenic mechanisms implicated in Alzheimer’s disease. Despite this difficulty (which bedevils all pathway-directed therapeutics), it is heartening and invigorating to have a newly discovered mechanism to consider in the quest to treat Alzheimer’s disease. Ransohoff, R. M. Science 353, 777–783 (2016). Karch, C. M. & Goate, A. M. Biol. Psychiatry 77, 43–51 (2015). Venegas, C. et al. Nature 552, 355–361 (2017). Musiek, E. S. & Holtzman, D. M. Nature Neurosci. 18, 800–806 (2015). Selkoe, D. J. Ann. Neurol. 74, 328–336 (2013). Cummings, J. Clin. Transl. Sci. http://dx.doi.org/10.1111/cts.12491 (2017). Heneka, M. T. et al. Nature 493, 674–678 (2013). Elliott, E. I. & Sutterwala, F. S. Immunol. Rev. 265, 35–52 (2015). Landreth, G. E. & Reed-Geaghan, E. G. Curr. Top. Microbiol. Immunol. 336, 137–153 (2009). Franklin, B. S. et al. Nature Immunol. 15, 727–737 (2014). Oroz, J., Barrera-Vilarmau, S., Alfonso, C., Rivas, G. & de Alba, E. J. Biol. Chem. 291, 19487–19501 (2016). Youm, Y.-H. et al. Cell Metab. 18, 519–532 (2013). Kumar, M. et al. J. Virol. 87, 3655–3667 (2013).